The leaves have all fallen off the trees and we’ve had some snow stick to the ground. I guess that means that winter has unofficially arrived here in Toronto! I can’t say that I’m happy to bid farewell to fall. As you know, there are so many things I love about fall, but I’ll admit, it’s beautiful to watch the snow. Typically, I prefer to watch the snow from the warmth and comfort of home, but you can’t hibernate all season. When I do venture out into the cold and snow, I like to wear my coziest pieces of clothing. Warm cardigans, cozy blanket scarves and my newest addition, Ecco Ukiuk boots. 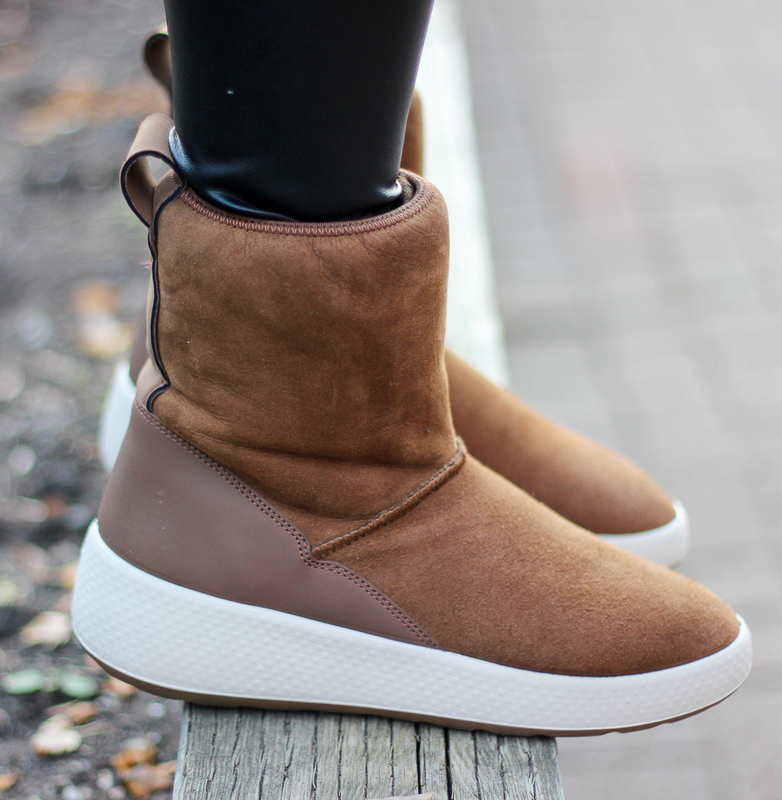 My Ecco Ukiuk boots are warm, comfortable and look cute with so many of my outfits these days! I always complain about winter, but there’s many people who are jealous that Canadians experience all 4 seasons. I was reminded of this in the comments I received on this flat lay I posted on Instagram. It was a simple photo, showcasing a cozy flannel and my Ecco Ukiuk boots. One of my long-time blog friends, Ivete from Girl in a Hot City, commented that she’s jealous that I get to wear cute winter pieces. I’m always taken with comments like that, because ultimately, the grass is always greener on the other side. I’m jealous of those in the south, who don’t have to experience painfully frigid days, or the stress of driving through snowstorms. That being said, I do love dressing for the cold. I’m always excited to wear warm plaid scarves, sweaters and boots. I know I will regret putting this in writing, but maybe… winter isn’t all bad? The Ukiuk boots are my first pair of shoes from Ecco, but oh my goodness, they are insanely comfortable! Up until recently, I hadn’t tried Ecco shoes or boots, but I fell in love with the brand and many of their pieces at a recent media preview. If you’ve never tried them before either, I highly recommend that you do. 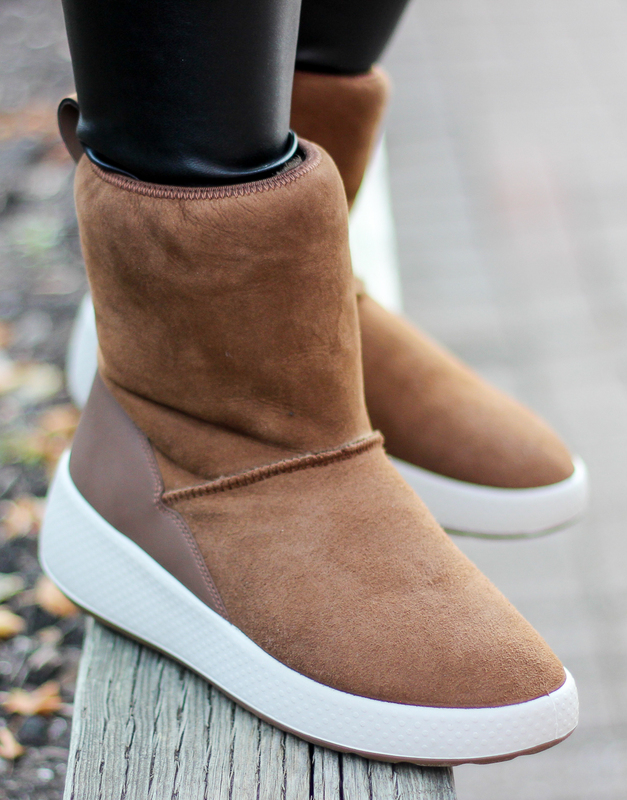 I ended up with the Ecco Ukiuk boots partly for their comfort and partly for their minimalist design. The boots are lined with lambswool, which keeps your feet warm and cozy. They also have good support for your feet, which is often the issue with similar boots. While I don’t plan to wear these in the middle of a snowstorm, they do have a rubber heel, which helps protect the suede and your feet from getting wet. I’m excited to pair the boots with my favourite boyfriend jeans, as well as with skinny jeans and my faux fur vest. Do you get to experience all 4 seasons where you live? That’s Right – I’m Rocking a Turtleneck! Beautiful as usual Jackie! Plaid scarf classics pair edwith funky leggings cool boots u are ready to brave winter! Sorry love it will come! These boots are adorable on you Lovely! Hugs! Such an incredible look.loved your boots. Those boots look cozy. Actually the entire outfit does and I love it! I can’t believe you guys got snow already! Lucky! It was 73 degrees Fahrenheit today (but rainy). Love this cozy outfit – I love a good leather pants look! And those boots are so cute! What a great cozy outfit! These boots look so comfortable – and I’m obsessed with your glasses!